Need help with the Search box? How to Find Just What You Need! Just browsing? Please check out our product catalog below to view all the categories of products that we offer, including birds, supplies and photos for the white dove release business, supplements, pigeon whistles, and discount cards. Looking for something specific? Find it using the Search box at left. Need more information? Check out the Quick Links, below right to learn more about our offerings and for more details about our birds; for bird raising instructions; for shipping, payments, and refunds information; and for additional services that we offer. White Dove Release Survey. Are you ready to have a White Dove Release business? 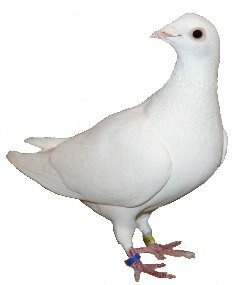 White racing homing pigeons and doves specifically for the white dove release business. Also, colored homing pigeons and rare breeds, exotic, and imported birds. Pigeon Supplies, Educational Supplies, and Business Supplies for your white dove release business. Photos for your white dove release business. Feed, vitamins, and other supplements to keep your birds healthy. Hand-crafted and imported in a variety of colors. These pigeon whistles have been known to keep the hawks away from the birds in flight. White Pigeon Sales preferred discount card, good for 10% off items purchased on the website.